Graz is a city known for it's food, design and history, and you won't find many places that are this full of great contrasts. 21st century buildings stand beneath a 500 year old tower, while Italian renaissance architecture overlooks street art and thriving nightlife - this city is easy to enjoy whatever you are interested in. It's proud to have UNESCO status as the biggest medieval historic centre in Europe, and was the European Capital of Culture in 2003. Hopping on and off trams or strolling around (the city is very walkable), you will see a place that has been changing for 850 years and is still reinventing itself now. 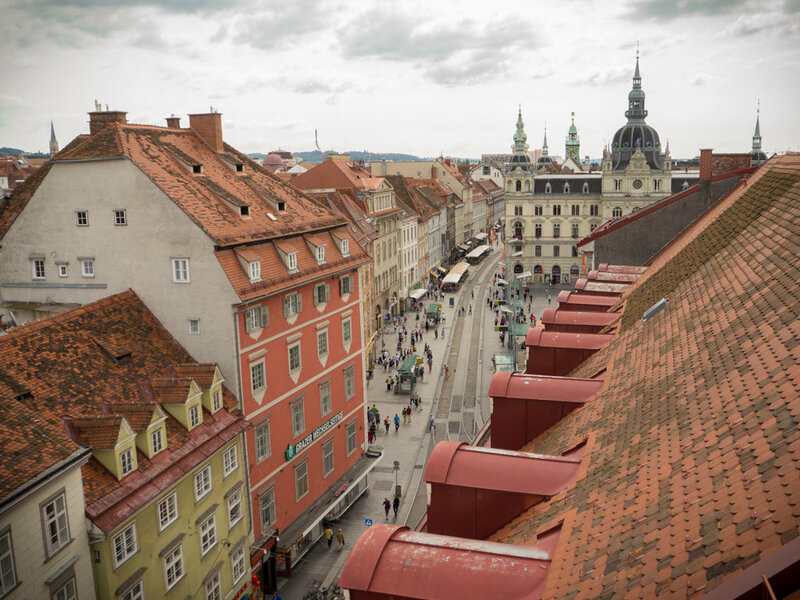 The 50,000 students in Graz give it plenty of energy, and in the Old Town, buildings with Baroque facades house modern shops on winding cobbled streets. Getting up above the city for a view from the Schlossberg is a must. The steps that take you above the fantastic roofline are not too much of a workout, but there is also a funicular and a glass lift if you prefer. From here you can easily spot some of the newer features of the city, such as the wacky design of the Kunsthaus, which lights up with LED displays at night, and the Island in the Mur. This last creation might look like a man-made island, complete with cafe and music venue, that you can reach from either side of the river - but it is actually an ingenius metal boat that rises and falls with the river flow. 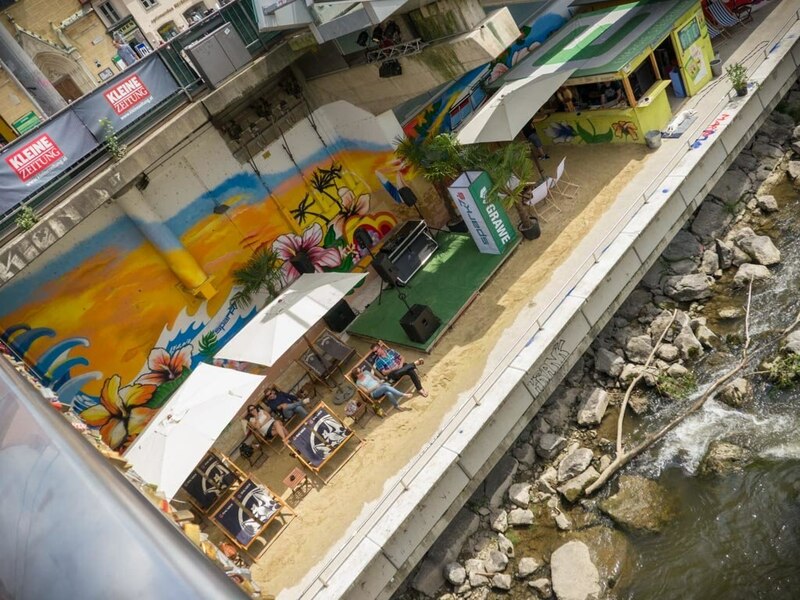 Two other cool things on the River Mur to check-out include the river-surfing wave named Terminator 2 and the funky city beach bar next to it, you can often watch river-surfers in action. Fans of shopping will want to visit Kastner & Öhler, a famous Austrian department store started in 1873. 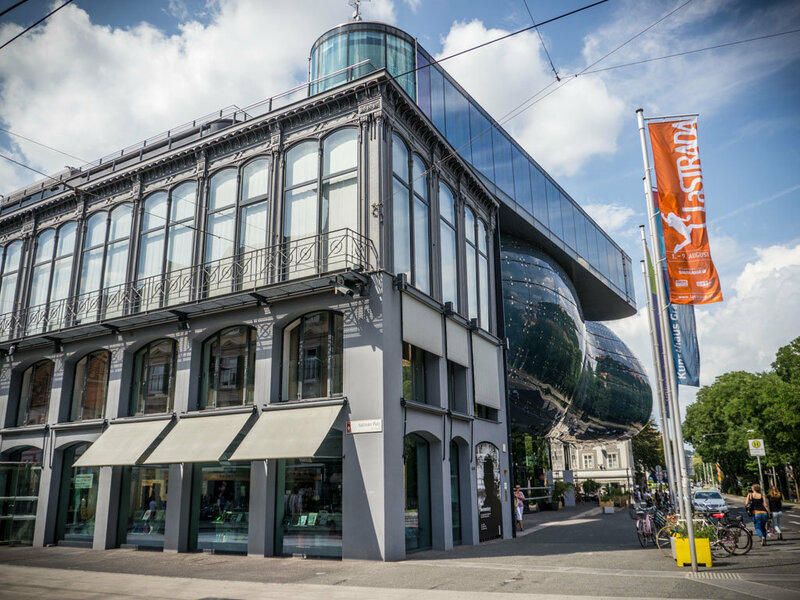 Graz is their headquarters, and the store here was decadently refurbished in recent times to add a 4th level and a popular rooftop cafe with another wonderful view of the city. If you love history and culture, the Styrian Armoury has over 30,000 weapons and suits of armour, there are many other museums, and the city is famous for it's beautiful Italian renaissance courtyards. If these are unlocked you are welcome to enter and enjoy them, the courtyards of the Priests Seminary and the Landhaus being great examples. For eating and drinking you will be spoilt for choice. 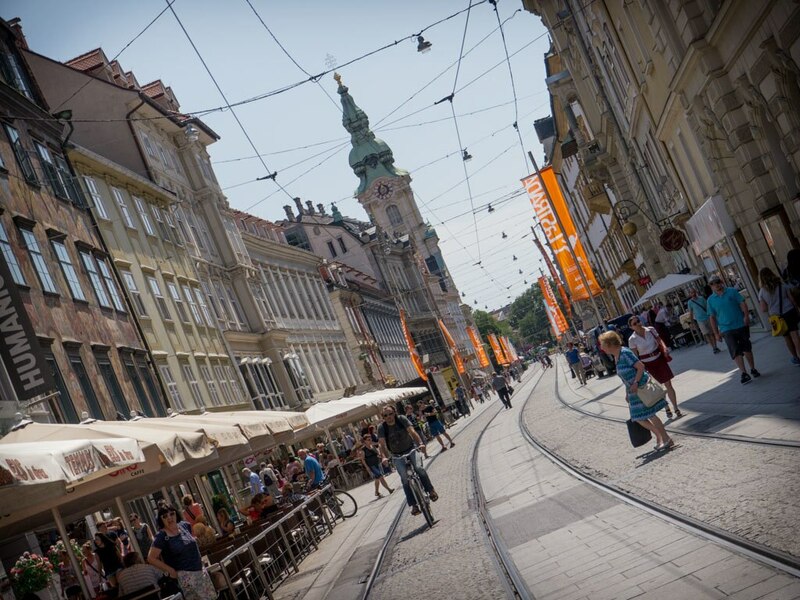 Whether you start by checking out the fresh produce at markets in Lendplatz, or Kaiser-Josef-market near the Opera House, great cafes and restaurants are all over Graz. There is a healthy mix of traditional Austrian, Italian and modern menu's, as well as late night food options for people checking out the buzzing bar scene in Lendplatz or other areas. You can easily discover Graz on foot, but there is a 3-day tourist ticket for less than €12 which allows up to 2 children under 15 to ride at no extra cost. The official colour of La Strada is orange, and it is hard to miss during the festival! The city has La Strada flags flying everywhere, shops put their Tshirts and signs in the window, and children carry the orange balloons around the city, which all adds to the spirit. Arnold Schwarzenegger was born nearby in Thal on the borders of Graz, which is why he was nicknamed 'Styrian Oak' as a bodybuilder, and Archduke Franz Ferdinand of Austria was also born in Graz. The oddly shaped Kunsthaus has many nicknames, like 'the friendly alien', but it's also interesting that the British architects who designed it decided to use 1,066 panels to complete it - a reference to the Battle of Hastings in 1066? Meeting the performers of Klaxon for a beer after the performance (everyone was invited!) and then wandering down to Open Dance to find a street party in full swing. Located in Lend, this hotel is within a 10-minute walk of Farmer's Market on Lendplatz and Graz Art Museum. Graz Town Hall and Styrian Armoury are also within 15 minutes. Located in the cultural city of Graz in South-eastern Austria, this modern, four-floor hotel is situated 500 metres from the Trade Show Centre and two kilometres from the Old Town. Early 20th-century hotel situated in the historic, picturesque city centre, one kilometre from Schlossberg mountain. Guestrooms feature floral decor and antique-style furniture, and have cable TV and high-speed wireless Internet connections. Guests can start the day with a buffet breakfast on the sun terrace, relax in the sauna or enjoy fine wine in the lobby bar. The unique boutique Hotel Zum Dom in Graz is the perfect choice for your stay in Graz. Located right in the heart of the old town of Graz, this 4 star hotel offers luxury accommodation in an exclusive ambiance, highlighted by the refined details and classy interiors characterizing Palais Inzaghi , the elegant building where the hotel is housed. Ideal as a starting point for visiting all artistic and cultural highlights, such as the island on the river Mur or the Kunsthaus (art gallery), Hotel Zum Dom is also within easy walking distance of the congress centre and the city hall. Even if the hotel enjoys a peaceful setting, you may reach all pubs, restaurants and bars of the famous Bermuda-Triangle in a matter of minutes. On-site amenities include a bar, an Internet Point and a wonderful roof terrace. The professional and friendly hotel team is looking forward to welcoming you soon as guests. Located in Lend, this hotel is steps from Mariahilf Church and Graz Art Museum. Graz Town Hall and Styrian Armoury are also within 10 minutes. Located in the heart of Graz, this hotel is within 1 mi (2 km) of Stadthalle Graz, Styrian Armoury, and Graz Town Hall. Mausoleum of Emperor Ferdinand II. and Graz Cathedral are also within 1 mi (2 km). Located in Gries, this hostel is within 1 mi (2 km) of Explosiv Graz, Graz Art Museum, and Graz Town Hall. Styrian Armoury and Graz Cathedral are also within 2 mi (3 km). Located in Gries, this hotel is within a 10-minute walk of Graz Art Museum, Graz Town Hall, and Styrian Armoury. Graz Cathedral and Mausoleum of Emperor Ferdinand II. are also within 15 minutes. Located in Lend, this bed & breakfast is within a 15-minute walk of Explosiv Graz and Graz Art Museum. Graz Town Hall and Styrian Armoury are also within 1 mi (2 km). The Palais Hotel Erzherzog Johann is a 4 star hotel in Graz city centre , renowned for its style and comfort for over 150 years, boasting the special atmosphere of the former baroque palace. This family-run hotel in Graz features an excellent restaurant in the baroque winter garden serving a traditional and Mediterranean cuisine, a Viennese coffee shop with homemade pastries and the Ernst Fuchs Cocktail bar. For your relax and wellbeing the hotel also offer a sauna, a fitness room and a solarium terrace boasting fantastic views over the roofs of the city.